Why start a business in Edinburgh? Taking the coveted top spot in the Startups Cities Index 2017 is Edinburgh. 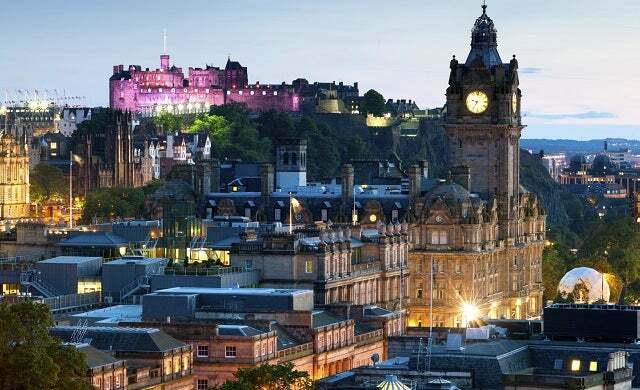 Scotland’s capital city, Edinburgh is home to some of the country’s leading science parks and research centres as well as a cluster of fast-growth businesses and emerging start-ups such as accounting provider FreeAgent, travel booking platform Skyscanner, sports platform FanDuel, and countless more. Combined with its growing business community and vast number of start-up premises, Edinburgh also offers a good central point for travel and commutes to client meetings. Scotland’s main airport Edinburgh International has 40 airlines travelling to 100 destinations, and Edinburgh is less than one hour’s drive away from the next largest city, and thriving start-up cluster; Glasgow. Edinburgh plays host to a range of office spaces and start-up support; technology incubator TechCube offers “world class” co-working space for tech start-ups alongside services and community support, and claims that it is “set to become one of the most desirable places to start a tech company in Europe”. Other available premises include Leith-based The Edinburgh Office which provides open plan co-working space across 7,500 sq ft, as well as a number of serviced offices in the city operated by Regus. For new businesses looking for a central location within Edinburgh, a new mixed use development, The Haymarket, is currently under construction in the city centre. The centre will look to offer 173,000 sq ft of space for businesses in its main building, plus additional space in its other nearby developments. Grade A listed business premises and business parks are dotted all around Edinburgh; Citibase has two fully-equipped business centres targeted at start-ups and small companies – one building is based in St Colme with the other based at the popular Edinburgh Park. Other business parks home to a growing mix of start-ups and early-stage entrepreneurs include West Edinburgh Business Park and South Gyle Business Park. Skill levels in Edinburgh are impressive with a talent pool that surpasses many comparable cities; 57.7% of the population are working age with NVQ Level 4 qualifications and above – the third highest on the list. This is hardly surprising given the world class university that calls the Scottish Capital home. The growing number of skilled workers in Edinburgh can be traced back to the three leading universities all based in and around the city centre; the University of Edinburgh, Queen Margaret University, and Heriot-Watt University. The University of Edinburgh is one of the top 20 universities in the world and ranks top in many polls for its research credentials particularly in life sciences, medicine, electronics and informatics. However, Edinburgh’s talent pool doesn’t come cheap; salaries are higher than the Scottish average with full-time weekly earnings averaging £559.70 a week in 2016. As a world-leading education provider, it’s not surprising that the University of Edinburgh looks to support the research and development of ‘new innovations’ in the city. Geared towards companies in the science and technology industries, the university has four business and incubation centres; the Scottish MicroElectronics Centre, Edinburgh Research and Innovation, Edinburgh Technology Transfer Centre and Edinburgh Technopole. Technopole is south of Edinburgh’s city centre and offers office accommodation to high-growth small and medium businesses looking to access facilities to ramp up development. Alongside tech access and desk space, the Technopole has several corporate research development centres with over 1,500 researchers on-premise. A similar centre for tech businesses is the university’s business incubation facility; the Edinburgh Technology Transfer Centre which works in partnership with the City of Edinburgh Council and seeks to act as a ‘launch-pad’ for start-ups and technology transfers. The university’s Research and Innovation unit is also focused at supporting new companies and looks to help new businesses scale to become well-structured enterprises. Targeted at a much more niche market is the Scottish MicroElectronics Centre. A joint venture between the University of Edinburgh and Scottish Enterprise, the centre provides space and support services to start-ups within the semiconductor centre. For bio-medical entrepreneurs, Edinburgh boasts “world-class” enterprise area BioQuarter; an academic medical centre just three miles from the city centre which extends to more than 100 acres. A £600m joint venture between Scottish Enterprise, NHS Lothian and the University of Edinburgh, the site brings together clinicians, industrialists, patients, scientists, state-of-the-art pre-clinical and clinical research facilities, and an academic teaching hospital. Described as ‘Scotland’s first pre-seed tech accelerator’, Seed Haus has launched in Edinburgh this year with a goal to find the next start-up unicorns (businesses with a valuation of $1bn or more). Founded by co-founder of Intelligentpos; Robyn Knox and former KPMG executive Calum Forsyth, the accelerator operates as a social enterprise and also offers funding to cover living costs so that start-up founders can leave permanent employment. Additional support is available to start-ups in the science and bio-medical sectors via Heriot Watt Research Park, Edinburgh’s “largest science park”, located on the west side of the city centre which acts as a hub for science and engineering research. The park has research labs, office space, conference and meeting facilities and is only 20 minutes from Edinburgh’s city centre by car. For new or recently started businesses in Edinburgh, the local council operates the Small Business Loan Fund – an interest free loan of up to £2,500 to help entrepreneurs get their idea off the ground. Mainly for companies in the first year of trading with a team of up to 10 people, the loan will only be offered to those with viable business ideas that are growing. Using similar eligibility criteria, viable commercial businesses can access a match-funded loan of up to £50,000 from the East of Scotland Investment Fund. This is only applicable to entrepreneurs who have been able to raise all funding from the usual traditional sources and thus must prove a funding gap. Angel funding is a growing finance source for Edinburgh businesses with Scotland’s “largest” angel syndicate Archangels based in the city centre. The syndicate is made of up over 100 investor members who invest circa £10m per year in early-stage Scottish businesses in return for an equity share. It currently has 26 businesses in its portfolio which are centrally in the science and tech industries such as web filtering company Bloxx, BioQuarter’s dental medical device company Calcivis, and Internet of Things (IoT) start-up NetThings. Other angel networks also applicable to Edinburgh businesses include Equity Gap and LINC Scotland. Technology-focused venture capital firm Scottish Equity Partners also has offices in the city. Accelerator space is another of Edinburgh’s strengths, home to a branch of the “world leading” Entrepreneurial Spark (ESpark) accelerator. Suitable for early stage and growing ventures trading for up to four years, ESpark runs two intakes in February and August with chosen participants given a package which includes collaborative work space, free Wi-Fi and IT facilities, and support from a “pool of over 50 expert mentors and advisors” for a programme of up to 18 months. House prices in Edinburgh are the steepest of all the major Scottish cities with the cost of the average house at £231,103 for September 2016, as reported by the Registers of Scotland (ROS). This is considerably higher than Edinburgh’s city rival Glasgow (£121,430) and Aberdeen City (£171,955). Given Edinburgh’s thriving entertainment, events and culinary scene, rising house prices are hardly surprising. According to VisitScotland, the city has more restaurants per head than any other city in the UK including five Michelin star restaurants; second rated only to London, and is also home to the British Hospitality Awards ‘Scottish Restaurant of the Year’ winner Ondine. The city also plays host to an array of farmers markets, drink attractions (the Scottish Whisky Experience is a popular favourite), and distilleries. In recent years Edinburgh has become more well known as a hive for the arts – home to the world’s largest art festival Edinburgh Festival Fringe which runs alongside the Edinburgh International Festival featuring theatre, dance and music. However, the city’s burgeoning house prices and thriving cultural scene appear to be amiss with its crime levels. In a report by the police watchdog HM Inspectorate of Constabulary in Scotland (HMICS) published October 2015, Edinburgh was found to have the highest crime rate in Scotland with over 738.2 crimes reported per 10,000 people – well over the average of 481.2. What’s more, HMICS also recorded the lowest levels of crime detection in Scotland with victims of crime in Edinburgh “less likely to have an offender brought to justice”. While this evidence is alarming, Edinburgh could well follow Glasgow’s suit – which boasts falling crime levels in the last year – and HMICS is working with the Edinburgh Division to improve policing. A first-hand account from an early-stage start-up on what it’s like to start a business in Edinburgh and what the city has to offer new entrepreneurs. You can also gauge insider opinion on what more Edinburgh needs to do to accommodate start-ups. Bottle branding company Personalised Bottles looks at the start-up opportunities on offer in Edinburgh. One of the benefits of working in Edinburgh is that it has a good rail service, every 15 minutes, to and from Glasgow. The journey time is 55 minutes approximately and stops at key suburban hub stations Croy, Falkirk and Linlithgow. With wifi on board the train is popular with commuters from the west. The road network, M8 and M9, is very busy during the morning and evening rush hours. A new Forth Bridge is also under construction which will reduce the journey time for Fife and Perthshire commuters. The new tram network, which eventually opened last year, has helped the commuters working outside the city centre and those long distance business travelers using the airport.